Introduction: A large body of evidence implicates adverse childhood experiences (ACEs) as significant factors in shaping adult health outcomes. Despite their wide-ranging impact on health, training on ACEs is lacking in most medical school curricula. As part of a required health equity course for first-year medical students, we developed a novel workshop on ACEs with an introduction to protective effects of resilience and trauma-informed care. Methods: This educational module on ACEs incorporated a didactic session on the science and health consequences of ACEs and best practices for trauma-informed care, followed by a facilitated case discussion in small groups exploring an ACE survey tool and a resilience questionnaire. Results: A total of 535 first-year medical students participated in the workshop in academic years 2016-2017, 2017-2018, and 2018-2019. In the session evaluation, students reported that the small-group, case-based discussion provided the richest learning experience. Areas identified by the students for improvement included delving more deeply into how to incorporate asking about ACEs in clinical care and how to involve multidisciplinary services in addressing ACEs. Discussion: The focus on raising awareness of the health impact of ACEs as well as enhancing resilience using a case-based approach was successful in meeting the stated objectives for the workshop. Future work will consist of building on this introductory content by designing curricular elements that explore multidisciplinary approaches to ACEs and trauma-informed care interventions in the clinical clerkships. Describe the physical and mental health consequences of adverse childhood experiences (ACEs). Discuss the use of the ACE survey in the medical home and how this may assist physicians to better engage and care for their patients. Discuss the impact of resilience on mitigating the negative health consequences of ACEs. Describe how trauma-informed care can benefit patients. When we reviewed content on MedEdPORTAL, we found no publications related to ACEs and one related to trauma-informed care in the context of caring for adult female sexual assault survivors.3 A small number of publications have described implementation of an ACE curriculum for health professions students,4 residents,5 and practicing physicians.6 Among medical students, one publication from authors at the University of California, Davis, School of Medicine described implementation of a 6-hour training on trauma-informed care for students enrolled in an intensive 4-week summer elective on race and health.7 After the session, students reported increased comfort in understanding trauma and its impact and in asking about ACEs, as well as increased knowledge about resources and tools for patients with a history of ACEs.7 However, we found no standardized activity for medical students where the authors had integrated the content into the traditional required preclerkship curriculum. As research moves from discovering the breadth of negative psychological and health effects of ACEs to validating interventions aimed at improving outcomes through trauma-informed care, it becomes imperative that health care providers receive training on ACEs as a health equity topic. There are many advantages to introducing ACE education in medical school, including engaging a large number of future physicians and providing a solid foundation for future education focused on recognizing and addressing the impact of trauma in clerkships and residency training. We integrated this mandatory 3-hour ACE workshop into the Health Equity and Social Justice (HESJ) course at Rutgers New Jersey Medical School (NJMS). NJMS introduced HESJ in academic year 2016-2017 (AY17) as a new, required, one-credit course, designed to be longitudinal over the preclerkship years. The HESJ curriculum reflects NJMS’s commitment to training well-rounded physicians through exploration of health disparities, with the belief that insights into variable patient perspectives can foster patient-centered medical practice. By encouraging students to think broadly about health care systems and interprofessional practice, they may better appreciate how physicians can play a role in supporting healthy communities. The HESJ course includes sessions on power and privilege in the physician-patient relationship, the role of unconscious bias in health care, racism and health, spirituality, the social determinants of health, intimate partner violence, working with underserved populations, exploring the patient’s perspective of illness, and motivational interviewing, among others. We included the ACE workshop in HESJ first in AY17 and then again in 2017-2018 (AY18) and 2018-2019 (AY19). We designed the workshop to enable students to review the current literature on ACEs and to engage in an interactive, case-based, small-group discussion. The ACE workshop aimed to help first-year medical students become familiar with ACEs and introduce principles of asking patients about trauma and resilience, as well as exploring potential interventions. Materials needed for the workshop included reservations for a lecture hall with a computer with PowerPoint and a projector, reservations for small classrooms for the small-group discussion (one for each group of 10-12 students), and printed materials. The session began with an introductory PowerPoint presentation (Appendix A) covering the current state of knowledge about ACEs from a scientific and health outcomes standpoint. The lecture reviewed the body of evidence showing that ACEs not only impact child health in the areas of brain development, immunity, and learning but also have profound effects on adult well-being with risk of lower levels of parent-child attachment12 and increased risks for cardiovascular disease, type 2 diabetes, depression, substance abuse, high-risk behaviors, and early mortality.1 We recommend that the 40-minute introductory presentation be followed by a 15-minute TEDMED Talk by Nadine Burke Harris13 that highlights a pediatric practice perspective on ACEs and segues into the upcoming small-group activities. The small groups consisted of 10-12 students led by one facilitator for an allotted time of 90 minutes. Our facilitators included faculty from multiple specialties (pediatrics, internal medicine, surgery, emergency medicine, and family medicine) or medicine/pediatrics residents. We supplied the workshop materials and instructions, including the facilitator guide (Appendix B), to all facilitators in advance at a training at the beginning of the HESJ course. Embedded in the facilitator guide were prompting questions as well as explanatory information for the facilitators only, which provided context and guidance. The training consisted of briefly reviewing the content of the lecture as well as discussing the case as presented in the facilitator guide using the prompting questions. We asked facilitators to share their own relevant clinical experiences as they applied to this particular case and encouraged the facilitators to attend the didactic session. During the small-group discussion, the students worked through an individual patient case utilizing the expanded Philadelphia ACE survey tool.14 The students received the student materials (Appendix C) during, rather than in advance of, the session so they could work on them within their small groups. The scenario consisted of the case of a young mother who had postpartum depression, likely influenced by adversity in childhood. Over the course of the session, the students completed the ACE survey based on the provided history. We included a blank ACE survey in the student materials and a completed ACE survey (from the case patient’s perspective) in the facilitator guide. The facilitators, through the prompting questions, encouraged students to discuss how best to engage the patient, identify resources for her, follow up with her, and ensure that her health care needs were met. Students also identified strategies that could be useful in office practice to facilitate collaboration with and referral to community-based support services, including mental health referrals for trauma-focused cognitive behavioral therapy and trauma-informed care interventions. In the facilitator guide and the student materials, we provided resilience surveys10,15 that the case patient had already completed as a starting point for discussing factors that could mitigate some of the impact of ACEs. We developed the Childhood Resilience Survey based on data from the Wisconsin Behavioral Risk Factor Survey.10 We obtained permission to use the Devereux Adult Resilience Survey15 to discuss ways that the case patient could reflect on and enhance her current resources for resilience. We encouraged the students to discuss how these questionnaires might be helpful in expanding their counseling for the patient, with the goal of elaborating on her internal resources and adaptive coping mechanisms. Students also identified possible barriers to using survey tools dealing with such sensitive issues while at work in a busy primary care practice. Assessment for the ACEs session initially consisted of multiple-choice questions testing content from the PowerPoint presentations incorporated into unit exams in the systems-based curriculum in AY17. However, students in both the course evaluation and focus groups felt that this approach was stress provoking and took away from broader, more humanistic themes that could not be assessed with multiple-choice questions. Based on student feedback, in AY18 and AY19 the assessment instead consisted of an online quiz (Appendix D) testing content of the lecture and the small group. We incorporated the grade for the quiz into the overall grade for the HESJ course. We provided an online anonymous evaluation form for the HESJ course to all students at the end of the first 2 academic years through an internal educational management system. We asked students to reflect back on all of the sessions in the course and report on how well each session had met its learning objectives. We also asked students to provide any comments about how the sessions and overall course could be improved. In those first 2 years, the evaluations were submitted approximately 9-10 months after the session and requested students to reflect on multiple other educational sessions in the HESJ course, limiting the number of questions that could be asked about each individual educational component. We found that response rates were low (less than 50%). In the third year, we expanded the session evaluation to include more detailed responses, as well as free-text responses concerning strengths and improvements (Appendix E). Students submitted their evaluations online using Qualtrics as a survey platform. We asked the students to submit evaluations within 1 week after the session. We conducted annual end-of-course focus groups for AY17 and AY18 to ensure ongoing student involvement in any course improvements and changes. We recruited eight first-year participants in AY17 and seven in AY18 from a class-wide email invitation and then via interested students who sought out additional participants. These self-selected students demonstrated an interest in health equity topics and provided predominantly positive feedback about the sessions. In the first 3 years of this mandatory session on ACEs and trauma-informed care, at total of 535 students participated. The average grade on the postsession quiz was 95% in AY18, with a range of 60% to 100%. In AY19, the average was 96%, with a range of 58% to 100% (SD = 0.92). Anonymous course evaluation forms were completed by 55 students (30%) at the end of AY17 and by 75 (41%) in AY18. In those first 2 years, 102 out of 130 students (78%) felt that the learning objectives as a whole for the ACEs workshop had been met to a considerable or very high degree. Twenty-seven (21%) felt that the learning objectives had been met to a small or moderate degree, and one (<1%) felt that they had been met hardly at all. There were few session-specific comments: Most were positive and reported that the session was eye-opening and impactful. The few critical comments focused exclusively on the bad timing of the session relative to other high-stakes obligations and mandatory lectures in concurrent courses. In AY19, 153 students (85%) completed a session-specific, more detailed evaluation form. We summarize the responses focused on the learning objectives in Figure 1. The students largely felt that their knowledge and skills improved with respect to the learning objectives; the learning objective that needed additional exploration compared to the others was defining trauma-informed care. The students reported that each of the components of the activity also contributed to their learning to high degrees (Figure 2), with small-group facilitator effectiveness rated most favorably. 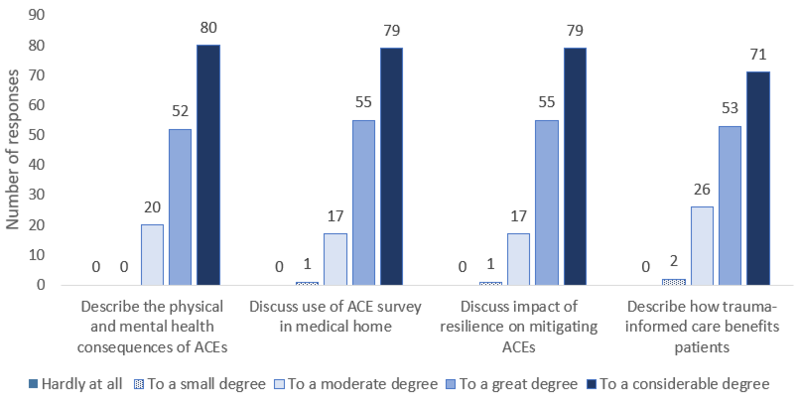 Lastly, 89% agreed to a great or considerable degree that they had gained a deeper understanding of the health effects of ACEs, 82% felt more comfortable asking about ACEs in clinical care, and 82% felt that additional training on this topic would be beneficial to their learning to become doctors. included in the total numbers. ACE, adverse childhood experience. individual components contributed to a change in attitudes or perspectives related to adverse childhood experiences (n = 153). Responses left blank are not included in the total numbers. For the strengths and improvements section of the AY19 evaluation (summarized in the Table), positive comments about the session focused on several themes, mainly increased awareness and an appreciation for interactive and collaborative learning in the small-group discussion session. Suggestions for improvement focused on adding more information on multidisciplinary approaches and on spending more time exploring how to approach ACEs and cope with them when detected in clinical practice. Abbreviation: ACE, adverse childhood experience. aN indicates the number of responses fitting the theme. Students in the focus groups in AY17 and AY18 reported that the session on ACEs stood out as particularly eye-opening and that it helped them give context to other HESJ topics, including the social determinants of health. In AY17, students also suggested and overwhelmingly supported changing the online open-content quiz format over incorporating questions into the unit examinations. Medical education on ACEs is valuable for enhancing awareness among future physicians and offering an introduction to evidence-based interventions that mitigate the long-lasting physical, psychological, and social effects of trauma. A recent emphasis by the medical literature, the media, advocacy groups, and governmental organizations on the importance of trauma-informed care for multiple patient populations in the United States8,9,16-19 makes this workshop timely for inclusion in health equity curricula. This workshop not only describes the impact of ACEs but also provides resources and asks students to think deeply about the influence of protective factors. With resilience a key component of providing trauma-informed care, promoting and fostering resilience have emerged as an important intervention that may protect against multiple psychological and physical effects of ACEs.11 While not validated, the resilience surveys provide a starting point for medical students in identifying what factors in a patient’s upbringing may have a positive and protective influences and in helping patients reflect on these positive influences. A current need in the literature on ACEs is to specify and develop a common set of positive experiences that can be used to probe for resilience or vulnerability.10 As research and innovation progress in this area, it will be important to include new findings in this workshop. During the first 2 years of offering this workshop, we encountered several challenges. The first challenge focused on timing of the session relative to exams for other courses. Through the course evaluation and the focus groups, it became clear that students wanted more space to be able to discuss and process the information without the burden of impending high-stakes assessments in other classes. Although the workshop can be difficult to coordinate with other courses given the advance preparation and logistics required for the small groups, we recognize that the difficult topics arising in the session require increased sensitivity to the other pressures that students face. Along the same theme, it is important to ensure that faculty facilitators are adequately prepared for emotional responses students may demonstrate in the small-group session based on their own childhood experiences. While no facilitator or student reported an adverse emotional reaction in the small group, during training several facilitators expressed concerns that the topic could trigger such a response. Training that includes concrete steps facilitators can take to address this (such as allowing students to excuse themselves if needed, assigning a student in the group to check in with distressed students, meeting with students afterward to express interest and concern, and involving the course director, a counselor, or peer support groups) is critical to enhancing facilitator buy-in and confidence. In the third and most recent iteration of the session, qualitative feedback indicated that students wanted additional practical information on how to use the ACE survey in clinical practice and how to address and cope with the trauma histories it can elicit. Students also overwhelmingly agreed that additional training on the topic would be important to them as they progress in their education. These data emphasize the importance of both enhancing the small-group discussion about the use of the ACE survey in practice and building on this introductory session later in the curriculum. A limitation of this work is that we cannot yet be sure the topics explored in this session will have a lasting effect on student knowledge or attitudes. The evaluation process focused on assessment of student perceptions about whether the workshop had met its learning objectives, rather than on assessing change in knowledge or attitudes. We also introduced this session very early in the medical school curriculum. While this can be effective in framing other health equity topics (such as social determinants of health and intimate partner violence), it may lead to a rapid undoing of knowledge and skills once exposed to the informal curriculum in the clerkships. Given these limitations, a key future direction is ensuring that health equity topics are further developed and enhanced in the clinical years. Multiple opportunities exist to develop content across specialties. Students can employ ACE surveys as a contextual tool to interview patients, accompanied by personal written reflections and/or structured discussions on rounds. Immersion in medical homes that practice under the principles of trauma-informed care provides another opportunity for learning through reflection and the development of personalized treatment plans. We specifically designed the materials described here for first-year medical students. However, because of the generalizability of the content, it can be adapted to other groups, including residents and faculty, as an introduction to the effect of ACEs on health. We will continue to build on the ACE curriculum over the continuum of medical education at our institution. Given the prevalence of ACEs across multiple facets of society and the immense impact ACEs have on health, it is essential that we train future physicians to employ trauma-informed frameworks in clinical care and innovate new interventions that promote resilience and wellness for vulnerable children and adults. Rutgers eIRB approved this study. Tink W, Tink JC, Turin TC, Kelly M. Adverse childhood experiences: survey of resident practice, knowledge, and attitude. Fam Med. 2017;49(1):7-13. Substance Abuse and Mental Health Services Administration. SAMHSA’s Concept of Trauma and Guidance for a Trauma-Informed Approach. Rockville, MD: Substance Abuse and Mental Health Services Administration; 2014. HHS Publication No. (SMA) 14-4884. Creating trauma-informed systems. National Child Traumatic Stress Network (NCTSN) website. https://www.nctsn.org/trauma-informed-care/creating-trauma-informed-systems. Accessed April 20, 2018. Sege R, Bethell C, Linkenbach J, Jones JA, Klika B, Pecora PJ. Balancing Adverse Childhood Experiences (ACEs) With HOPE: New Insights Into the Role of Positive Experience on Child and Family Development. Seattle, WA: Casey Family Programs; 2017. Burke Harris N. How childhood trauma affects health across a lifetime. TED website. https://www.ted.com/talks/nadine_burke_harris_how_childhood_trauma_affects_health_across_a_lifetime. Published September 2014. Accessed April 16, 2018. Philadelphia ACE Project. Health Federation of Philadelphia website. http://healthfederation.org/ACEs. Accessed May 16, 2018. Mackrain M, Bruce N. Building Your Bounce: Simple Strategies for a Resilient You. 2nd ed. Lewisville, NC: Kaplan Early Learning; 2013. Resilience/Stress Questionnaire. Wisconsin Coalition Against Sexual Assault (WCASA) website. https://www.wcasa.org/file_open.php?id=801. Accessed April 23, 2018. HIV/AIDS Bureau. Division of Policy and Data consultation overview: trauma and HIV—executive summary. Health Resources and Services Administration website. https://hab.hrsa.gov/sites/default/files/hab/Publications/factsheets/traumahivconsultation.pdf. Published December 2015. Adverse childhood experiences (ACEs). Centers for Disease Control and Prevention (CDC) website. https://www.cdc.gov/violenceprevention/acestudy/index.html. Updated April 1, 2016. Accessed April 23, 2018. Winfrey O. Treating childhood trauma. CBS News website. https://www.cbsnews.com/news/oprah-winfrey-treating-childhood-trauma/. Published March 11, 2018. © 2019 Pletcher et al.